On offer is the exceptionally sought-after but NEVER comes up for sale Paper Wings Wild Horses maxi halterneck dress, in the Desert Rose (like a watermelon pink) colourway. The fabric in this is glorious, a super-soft and flowing cotton sateen, and it features a shirred/elasticised low back with fab drawstring ties on the hemline allowing you to ruche the skirt up as you choose. As you can see when you compare the photos now to the stock photos/shot of my daughter on the first day she wore it, the horses have faded, and she's only worn this on a few special occasions, so I am not sure if this is an intentional part of the design but the main body of the dress isn't hugely faded at all - I only know this as I have a larger New With Tags version still sitting here. I have washed and cared for it very carefully so it is what it is and it still looks AMAZING. Girls love this dress! A generous Size 7, it measures about 86cm long from the centre of the front bodice to the hem, with the overall length adjustable. This is a lovely twist on the wardrobe staple of a denim skirt. Lovely quality from Seed Heritage, it's in a 98% Cotton 2% Elastane with a zip front, classic 5 pocket jeans styling, an adjustable tab-button waist and a fun star print throughout. Size 7, it's about 28cm long and in great, gently used condition with just one tiny line mark on a rear star which would never be seen when worn. This lovely skirt from Seed Heritage is in a grey marle and navy striped cotton windcheater fabric, with a ribbed, elasticised waistband and functional drawstring ties. Size 7-8, it measures about 28.5cm long and is in good used condition with just light wash fade and wear. This beautiful pinafore dress from Country Road is in an off-white (I think it was called marshmallow?) 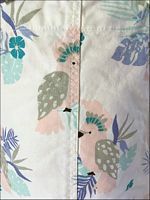 drill cotton with a pastel Pink Cockatoo print throughout. Size 7, it's about 62cm long shoulder to hem and in great, gently used condition with just one small line on the front which hasn't washed out. This gorgeous pleat skirt from Seed Heritage is in a metallic silver 51% metallic 49% nylon blend with a navy grosgrain ribbon elasticised waistband. Size 7, it's about 29cm long and is brand new with tags, retailing at $60. Dry Clean Only.